This is one from my own collection; my mom gave it to Groovy Girl two years ago and we've made nothing from it in all that time. Shame on me! This summer that is going to change as G.G. is taking over the garden space in back and has very definite ideas about planting....and she has my mom in her back pocket. I thought I should highlight this book so we can challenge ourselves to use it more frequently. It's kind of amazing the wonderful books that already reside in my cookbook cupboard-yes, they reside in a cupboard or two and it makes them a little out of sight out of mind. I go to specific cookbooks for specific recipes and I need to learn to mingle a bit more in different books. I pulled this one out a few days ago and started reading. The first twelve pages give an excellent overview on gardening-everything from tools to making your own compost. The two pages on "pots and plots" gave me great ideas on using a variety of everyday items (like a laundry basket) that could be used for a planter. There are two pages on "Kitchen know-how," which includes an easy vocabulary list with pictures to match. The remaining pages are filled with how to grow a vegetable or fruit plant with a companion recipe; each spread takes about four pages. Bloomfield begins with tomato and most of the planting directions involve container gardening but could easily be translated to an actual garden plot. Nestled in are big tips like "grow marigolds in the same pot as your tomato plant. These flowers can keep away aphids, which might otherwise infest your tomato plant. This is called companion gardening." (19) I didn't know this and it makes me want to run out and buy a few marigold plants as my tomato plants often suffer from buggy yuck! The tomato recipe follows eggplant growing directions and combines the two veggies in a Tomato and Eggplant Tower (23) Yay. Yum. Groovy Girl has an eggplant growing in the back garden. Recipes range from mini pumpkin pies, giant beanstalk stir-fry, mashed potato fishcakes, onion and leek soup, chocolate and mint mousse and lemonade ice-pops. All very yummy looking with eye-catching photographs. My personal favorites are the Sunflowerpot loaves (aren't they cute!) and Green leaf tarts (spinach). We didn't plant any spinach this year but if I can find some at the Farmer's Market today I may try to make these over the weekend. The sunflower link above will take you to google books where you can browse a few pages of this fabulous kid-friendly book. Buy it from an indie bookstore here. Find Jill Bloomfield at her website...teachkidstocook.com. I was up early this morning, waiting for my chicken man-doesn't everyone have one? Tim Daley of Daley's Shamrock Acres delivered 6 homegrown chickens to me and they are now in my freezer. For an ex-vegetarian who still thinks like a vegetarian it seems strange to get so excited about six beautiful chickens but I am. I can't wait to slather them with herbs and a little butter and cook them up for my family. 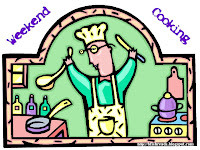 Happy Cooking over the long holiday weekend! This post is linked to Beth Fish Reads Weekend Cooking meme. Click to her post to see what everyone else is cooking up! Anyone with a food-related post can play along.